Insurgents have also used 120-mm mortars near Mar’inka, Krasnohorivka, and Pisky along with 82-mm mortar and AGS-17 [grenade] fire, by several insurgent groups who advanced towards the positions of ATO forces within range of effective fire. In the vicinity of Mar’inka, insurgents used an armored group of two T-72BA tanks and a BMP-2 during the night. This armored group advanced towards the front under cover of mortar attacks and tried to suppress the firing positions of Ukrainian troops with fire. Two terrorist units fired at the positions of the ATO forces between Krasnohorivka and Mar’inka with 120-mm mortars. Several armored groups of insurgents have also operated in the vicinity of Opytne, Vodyane, and south of Avdiivka. The enemy led adjusted fire from tanks and IFVs on the positions of ATO forces; insurgent armored vehicles have also opened fire several times. After these attacks on the positions of Ukrainian troops, insurgents used 120- and 82-mm mortars, AGS-17 grenades, and heavy machine guns to provide cover for the maneuvering and relocation of their armored vehicles. The locations of the permanent deployment of these armored groups of terrorists have been identified in Spartak, Yasynuvata, and the western part of the Kyivskyi district of Donetsk (the village of Vesele and the Stratonavtiv Street). Insurgent artillery units have been observed in the vicinity of Donetsk airport; they attacked with three 2S1 “Carnation” 122-mm self-propelled guns and six D-30 122-mm howitzers). The enemy continues to actively shell the positions of ATO forces near Avdiivka (both the northern and southern sides of the city). Most of the attacks are carried out by the terrorist artillery units of the so-called “Horlivka garrison” (four batteries of 122-mm artillery and a 6-cannon battery of 2A65, 152-mm “MSTA-B” howitzer – the IR group has previously recorded the transfer of this unit to a district of Donetsk). 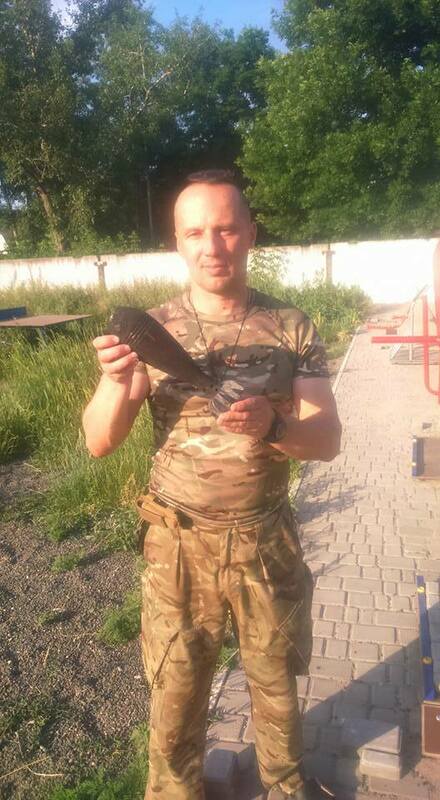 Battalion Sich: “These are gifts from Muscovites that arrive at the stadium in Avdiivka.” Source. In the vicinity of Luhanske, Kamyshevakha, and Zolote, the enemy actively uses tanks and mortars. Fire strikes are carried out at dusk and at nighttime at targets identified in daytime. A low level of training of the insurgents who are part of mortar detachments has been observed. The enemy carried out shellings of the settlement of Krymske from 122-mm guns (“nomadic” 3-cannon battery of 122-mm “Carnation” self-propelled gun that was previously observed near Trokhizbenka). Toshkivka and Novotoshkivka have been shelled from an MLRS BM-21 “Grad.” Insurgents fired from 120-mm mortars and AGS-17 [grenade guns] at the positions and objects near Shchastya from the vicinity of Vesela Hora. In the past 24 hours, the terrorists have transferred an integrated unit to the area north of Luhansk (through Haiove, Yuvileine, Dzerzhyske) – six tanks (four T-72B and two T-72BM), three 122-mm 2S1 “Carnation” self-propelled guns, two 152 ACS-mm 2S3 “Acatsiya,” four BTR-80, a BTR- 82A, and four BMP-2. The equipment and weapons have been partly restored at engineering workshops in Perevalsk, and some [of them] came from the Zarya battalion. The convoy also included four Kamaz [cargo trucks] with insurgents. In the vicinity of Obilne, a unit of servicemen from the Russian Armed Forces, disguised as local “militia” (about 50 people), has been observed. The unit was accompanied by six BTR-80 and two Kamaz Mustang [military utility] trucks. Four “Vintorez” sniper rifles (Russian silent sniper rifle for special forces) have been observed among the weapons used by the Russian servicemen. This entry was posted in Dmitry Tymchuk, English, English News, Pictures, South&Eastern Ukraine, War in Donbas and tagged #freekohver, #FreeKolchenko, #FreeKostenko, #FreeSavchenko, #freesentsov, #Information_Resistance, #RussiaInvadedUkraine, #StopRussianAggression, #UkraineUnderAttack, Dmitry Tymchuk, Donbas. Bookmark the permalink. É muito difícil para os ucranianos enfrentar os russos apoiado pelo ditador putin. putin veio das profundezas do inferno para atormentar os cristãos.